One of the hardest lessons you learn as an entrepreneur is to narrow down your options and find focus. Most of us learn this through failure, after chasing too many possibilities at once. From identifying the right problem to solve, to figuring out what your beachhead market is and who your paying customer is, it’s always a struggle to let go. The currency of modern-day entrepreneurship is ideas. Not an idea but ideas. We’ve talked about this in the context of defining the right problem to solve. Founders have all these ideas about what their product should do and what it should look like, that they lose focus on what they’re trying to accomplish with it. When you ask them “Who will buy this product?” you’ll also get a multitude of ideas, usually starting with “millennials” or “women aged 25–35”. These “customer goggles” make founders see potential customers everywhere they look. Narrowing down their own ideas is not something most people can do. This is where a mentor comes in really handy. As it’s been my experience, having someone who already went through this process (several times) and has helped other founders filter their ideas will make the process so much easier. Founders who choose to map their startup building process on the Disciplined Entrepreneurship framework developed by Bill Aulet, Managing Director of the Martin Trust Center for MIT Entrepreneurship start off by creating an end user profile. An end user is a person who will be using the product or service. Sometimes the same person will play the role of the economic buyer, but that is not always the case. The Decision-Making Unit can be quite complex depending on the market you address. In B2B the end user is usually the employee using the new tool, while the compliance officer will be the IT manager and the economic buyer the Finance Manager. Ensuring that entrepreneurs thoroughly research their end user is a step you never want to skip. If founders don’t take the time to fully understand who will be benefiting from their product or service, how their new idea will be used and what those people are like in day-to-day life, you run the risk of having them create something no one will buy (or invest in). A less fortunate example of this is Juicero, ‘America’s favorite $400 juice machine’ that came to a tragic end in 2017 after raising more than $118 million in funding from prominent VCs like Google Ventures and Kleiner Perkins. If you can squeeze the juice bag with your bare hands faster than the machine, why would you buy an expensive device to fulfil the task? How to create an end user profile? Start with the problem definition framework, where you guide founders to re-frame their idea into a real problem, rather than a solution. A problem is not the lack of a solution. It is a pain that affects the lives of a significant number of people, who would pay money to have it fixed. As a founder, what you want is not important. Did you start your company with the solution as the center of it and customers rotating around it? Invert that. Start viewing the customer as the hub and the solution(s) rotating around them. Your original idea may not be the best. 2. Who else has that problem? Have your startup team brainstorm all potential customers. Who can use this idea or technology? Map all your ideas, without restriction. The more specific, the better. Selecting broad market segments will render them meaningless. ‘Consumers’ is not a relevant market segment. ‘24–30-year-old male, who is online and makes over $75K per year and lives in an urban environment’, on the other hand, tells you something very specific about your customer. 3. Who are you going after first? Are there enough potential customers in that segment to render it viable? Are they willing to buy your solution? Is the pain they’re experiencing a real pain (or just a minor discomfort)? Can they afford your solution? Can they spread the word to others like them? It’s here where the pain of narrowing down and the fear of focusing on the wrong segment starts to creep in. Don’t let startup founders fall into this trap. Chasing too many segments or choosing the wrong one is the real risk. Identifying the right one, on the other hand, will guide the development of a product these potential customers will actually buy and use. Here’s where we try to go into as much detail as possible regarding who the potential customer is. To do that, we’ll be creating a semi-fictional profile of the ideal customer based on real customer data and educated speculation. The purpose of this profile is to understand the customer demographics, behavior patterns, motivations, and goals that will drive these people to choose your solution. The goal is not to have a list of job titles or specific people, but to identify common behavior patterns, shared pain points, goals, and challenges that potential customers have. Every decision regarding product development, sales, and marketing or business development should tie back to this profile. The first step is creating a list of questions you want the profile to answer. The more industry-specific the questions, the better the profile. For the purpose of this exercise, we’ll be looking at some key, general questions which can be tailored for each specific industry segment. What work experience do they have? While this is some of the easiest information to obtain, it’s not relevant on its own. This quantitative overview is just a small part of who the buyer persona is. What do they fear most? These psychological variables will give you a qualitative description of the end user. The focus here should be on the motives behind behaviors. If you’re working with a startup developing a meal scheduling and preparation app, questions like ‘How many meals a day do they have?’ or ‘How much do they spend on takeout’ will be relevant here. What products are they currently buying? You’ll recognize this question from the problem definition framework. This time, you’re researching your ideal customer more in-depth. The solutions that the end user is using to address the problem you’re trying to solve will help you understand their motives and behaviors better. What attributes are they looking for in these products? Why these products and not others? How are they choosing them? How much are they willing to spend for them? What websites/newspapers/apps do they use to stay informed? Do they watch TV? What channels? Do they listen to the radio? What stations? Do they listen to podcasts? Which ones? Watering holes are the channels or places where your potential customers congregate and exchange information. Both proxy products and watering holes are great for corroborating your demographics and psychographics. If you’re a B2B marketing agency, you’ll probably want to know what type of content they consume or what keywords they use when researching their problem. A persona is a real person, that matches you end user profile to the extent you can call that person up every time you need to learn more about your end users. Creating a profile means defining all the attributes identified in the end user profile step and enhancing with additional “soft” information. Think of this as a shadowing experiment, where you try to come as close as possible to live a day in your user’s shoes. This day will be composed of multiple people’s experiences. The resulting story will help you piece together all your existing information. A list of facts won’t be as helpful as a story that draws connections and emphasizes why people behave the way they do. Weave those facts into a story that paints a relatable picture of who your persona is. Keep it fictional, but still realistic. You might feel like you’ve already done this in the Psychographics. This time, you want to prioritize those fears and motivators to find out what keeps your persona awake at night and what makes them get up in the morning. Their top drivers, if you will. This will help you as a prioritization criterion when deciding what features to keep or what marketing strategy to adopt. Sean is originally from Denver, studied Telecommunications in Raleigh, at UNC-Chapel Hill, then relocated to San Francisco with a colleague. During an internship at AT&T, they started working on a new protocol for mobile data transfer and later formed a startup around it. One of the AT&T managers put in the initial seed money to get them going and also helped them sell the startup to Cisco two years later (just before the dot-com crash). Both Sean and his cofounder made $4M out of the deal. Sean decided to invest, but the timing was not that good and lost half of his investments when the market fell. During the 2000s, Sean made smaller seed (10-80k) investments which became fruitful in 2011 when the market came back and acquisitions started again. These small exits eventually increased his net worth to $11M. In 2013 he decided to move his family to Boulder, CO to help Brad Feld with some of his ideas, but also for the great lifestyle. After a few months of mentoring for Boomtown Boulder (a local accelerator), he joined Bullfrog Capital, a new seed fund in Boulder focusing on AI & Robotics. He’s now helping Bullfrog Capital to open a European office, and he travels to London every 2 months to meet with relevant accelerators, corporations, and universities. He’s always monitoring the progress of his portfolio and having calls when he’s traveling. Sean values progress, he doesn’t usually have a lot of patience and he believes in the power of networking. As an investor, he is eager to find better investment opportunities, sourcing some good deals in Europe faster and making sure current portfolio companies move faster. At the moment, he’s feeling reluctant to invest in early-stage startups in new territories. He struggles when interacting with founders who are not pragmatic or try to oversell him on their ideas and prefers to meet face-to-face, even after investing in a new venture. The (hopefully pre-existing) primary market research is a good starting point. However, to build an accurate representation of your persona, you’ll need to do additional primary market research. What started out as ‘24–30-year-old male, who is online and makes over $75K per year and lives in an urban environment’ needs to become a detailed profile answering all the questions I’ve listed before. If you’ve done a thorough job researching your primary market this step will take less. I know from personal experience how tempting it can be to skip over or rush through this step because you’re eager to finally develop the tech and change the world. With the risk of sounding like a broken record: don’t do it. Take the necessary time to do it properly and I promise it will help you create a better product. Most businesses create more than one persona. However, I recommend you focus on your primary persona first. If you already have customers, this is your starting point. Who better to help you understand your target market than the people who chose to become your customer? Start with qualitative interviews where you get as much information as possible to answer the questions you’ve set. Compile and transform these notes into a complete personal profile that aggregates data from all customers. If you don’t have any customers yet, try to find people in your market segment. You can do this online, by searching for questions they’re asking on search engines, social networks or on key industry blogs and publications. Use keywords and content tools to figure out as many answers to your questions as you can. Ideally, you should also try to meet these people in real-life at conferences or events, or through your network of friends and connections to validate the answers you’ve found. One of the most common questions I get regarding personas is ‘How many people do you need to talk to?’ There’s no perfect number. Talk to as many as it takes to start to discover patterns in their answers. 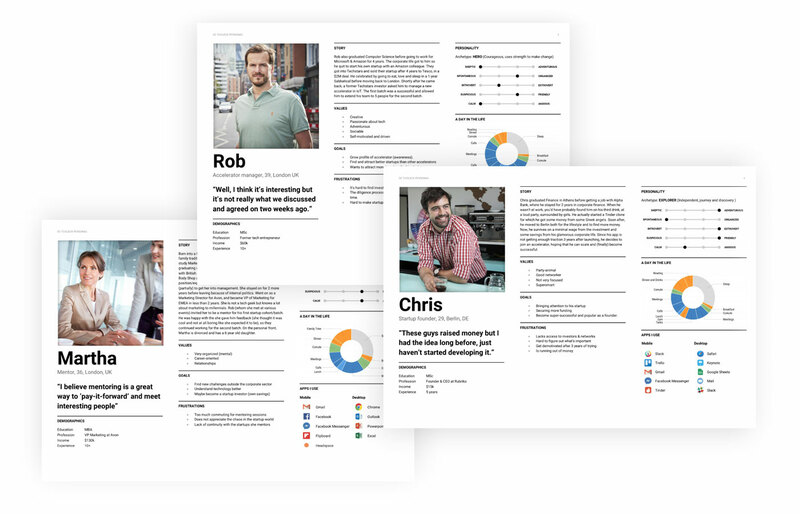 Download the above free persona templates to use for your startup. The exercise in itself doesn’t seem too difficult for most founders. The truly difficult part is keeping this persona top-of-mind. 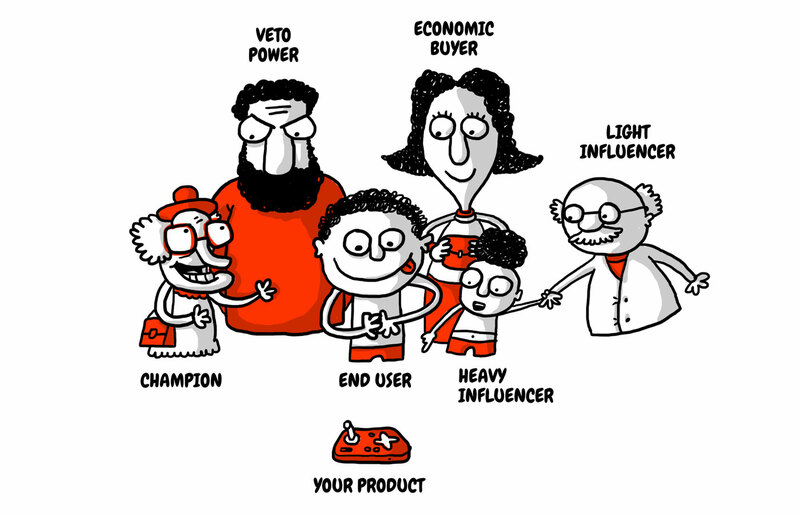 I can’t tell you how many startups I’ve seen do their market segmentation, create their personas and then go back to chasing five different industries. With so many things happening at once, it’s easy to get sidetracked and cave to that fear of missing out. There are also cases when startups begin to sell to an entirely different segment than the one they used to map their persona just because it was easier to sell there. In cases like these, it’s obvious that they choose the wrong persona to start with. It may also be that it is easier to sell to your group of friends, but once you get out you realize similar people do not really want/need the product. The most likely scenario is that their initial profiling was just building on their existing bias of who they thought they want to sell to. Good research is the only way to avoid that from happening. Finally, keep in mind that your persona is constantly evolving. Every couple of months or so you should be updating it with new information you’ve learned about your prospects and customers so that it stays a relevant beacon for your business to focus on. Found it useful? Share it with other disciplined entrepreneurs. Vlad is an alumnus of the MIT entrepreneurship program in Romania, serial entrepreneur and marketing consultant. He has been working for over 10 years in starting and growing tech companies and just flips out when it comes to digging into, connecting, tracking and analyzing data. In love with travel, lives in South America, and is involved with startups in Europe, North and South America.